3BR Glade Valley House w/Mountain Scenery! Property 14: 3BR Glade Valley House w/Mountain Scenery! Described as - A Very Special Place, Serene & Beautiful, Our Dogs are in Heaven. Property 16: Described as - A Very Special Place, Serene & Beautiful, Our Dogs are in Heaven. Dog Friendly Vacation House / Cabin at a Winery & Vineyard ! Property 21: Dog Friendly Vacation House / Cabin at a Winery & Vineyard ! Rushing River 3 Story Mountain Cabin Paradise on 20 Acres! 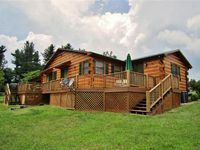 Property 22: Rushing River 3 Story Mountain Cabin Paradise on 20 Acres! 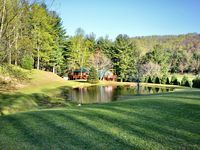 Cabin at Mill Pond,Secluded 10 Acres, Biking,Hiking,Peaceful. Property 24: Cabin at Mill Pond,Secluded 10 Acres, Biking,Hiking,Peaceful. Property 26: PRIVATE 150FT WATERFALL RIGHT OFF DECK! Rustic, Asian inspired. Blue Ridge Country Home - Booking for spring! Property 27: Blue Ridge Country Home - Booking for spring! Private Parkway Estate.Sleeps 10+ & pet friendly. 90+ all acres to yourself. Property 30: Private Parkway Estate.Sleeps 10+ & pet friendly. 90+ all acres to yourself. Mitchell River House - as seen in the Nicholas Sparks movie The Longest Ride! Property 43: Mitchell River House - as seen in the Nicholas Sparks movie The Longest Ride! Property 44: Discounts available for extended stays. 3 BR Glade Valley Home close to Golf Courses and Blue Ridge Parkway! Property 45: 3 BR Glade Valley Home close to Golf Courses and Blue Ridge Parkway! Fully Furnished Park Model with a scenic view of Stone Mountain. Property 49: Fully Furnished Park Model with a scenic view of Stone Mountain. 15 min to Mt. Airy - Perfect for Company/Church/Family Retreats in Wine Country! Property 50: 15 min to Mt. Airy - Perfect for Company/Church/Family Retreats in Wine Country! Amazing ! Our family fell in love with this hidden gem. It&rsquo;s gated so you have your own privacy, they have their own lake in which you can go fishing which the boys loved. The owner was very good with communication and even left us recommendation for nearby marketplaces, restaurants and bars which really came in handy. The house had absolutely everything we needed, including games for the family and they left us chopped wood for the fire pit which we were able to use upon arrival! Highly recommend this place for anyone looking for a relaxing family vacation.